Buy first, then share a special link. If three friends buy, yours is free! 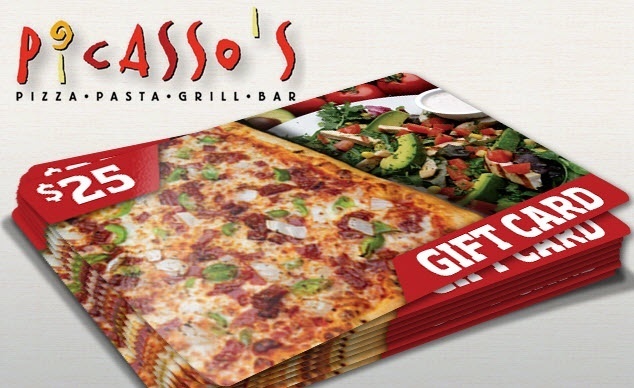 For 25 years, Picasso’s Pizza and Pasta Grill has been making award winning pizzas right here in Dallas’ great neighborhoods. The Dallas Observer people’s choice award winner’s menu has grown to include homemade recipes like Baby Back Ribs, Tuaca Lime Shrimp Fettuccini, and the amazing Crispy Chicken and Avocado Club. We recommend the Pan Seared Sea Scallops over Linguine in Lobster Cream Sauce. Picasso’s also recently introduced a gluten-free pizza crust to rave reviews. Health conscious foodies will love this option. With full service bars and flat screens at each location, you can enjoy a great meal while cheering on your favorite sports team. It’s all conveniently located off the Dallas Parkway. With this special offer, purchase a $25 gift card for just $15. Buy another as a gift! Will be mailed to you within 5 business days. Valid at all 3 DFW locations.